The Salmonella are facultative anaerobic Gram-negative bacilli, motile, non‐capsulated, non-sporing organism. Salmonella currently comprises of about 2,500 serotypes or species. All of them are potentially pathogenic Salmonella produce 3 main types of diseases in human. These are enteric fever, food poisoning (Gastroenteritis) and Septicaemia. Most of the other Salmonella are chiefly pathogenic in animals like poultry, pig, rodent, cattle, parrot and other. Salmonella is gram-negative bacilli arranged mainly singly or in pairs. It is non‐capsulated, non‐sporing. Most of the strains are motile due to the presence of peritrichous flagella except S. Gallinarum and S. Pullorum, which are non‐motile. Measuring 1‐3 μm long 0.6 μm wide. The problems involved in the taxonomy and nomenclature of this group of bacteria g p can only be understood in the historical perspective. At first, the genus Salmonella appeared to comprise species that differed only in their antigen structures. Species names were therefore used for what turned out to be serovars. 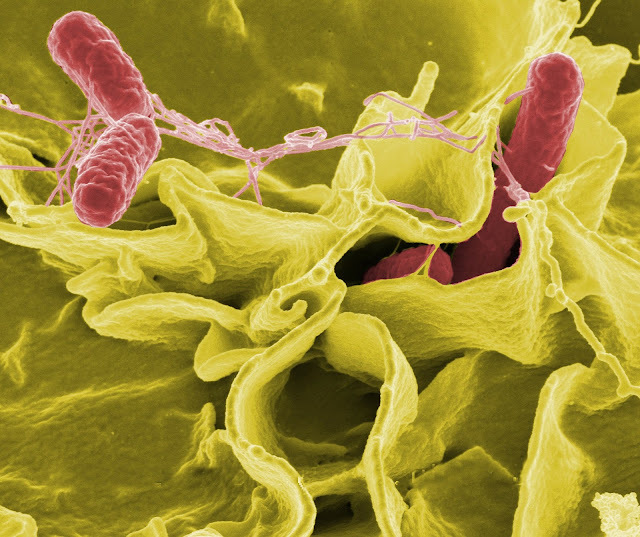 More recent molecular studies have demonstrated that the genus Salmonella contains only two species that can be subdivided into seven subspecies. All of the important human pathogen salmonellae belong to the subspecies enterica. The (false) species names for the serovars had, however, already become normal usage. In view of the fact that the causative pathogens in typhoid salmonelloses, a clinical picture clearly differentiated from Salmonella gastroenteritis, are only serovars of the same species/ subspecies, the official committee has, however, not adopted the new nomenclature as yet. All antigenic formulae of recognized Salmonella serovars are listed in the White‐Kauffmann‐Le Minor scheme, and newly recognized serovars are reported every year in the journal Research in Microbiology. The nomenclature system used at the United States Centers for Disease Control and Prevention (CDC) is based on recommendations from the WHO Collaborating Centre, which is responsible for regular updates of the scheme. In order to avoid unnecessary confusion between serovars and species, the serovar name is not italicized and starts with a capital letter. As not all serovars have a name, for those designated by their antigenic formulae the subspecies name is written in Roman letters, followed by their antigenic formulae – including O (somatic) and both phase 1 and phase 2 H (flagellar) antigens. Approximately 60% of all Salmonella serotypes belong to Salmonella enterica subspecies enterica. Within this subspecies, the most commonO‐antigen serogroups are A, B, C1, C2, D and E. It must be noted that strains in these serogroups cause approximately 99% of Salmonella infections in humans and warm‐blooded animals. The nomenclature of the genus Salmonella has evolved from the initial one serotype‐one species concept proposed by Kauffmann on the basis of the serologic identification of 'O' (somatic) and 'H' (flagellar) antigens. Each serotype was considered a separate species (for example Salmonella paratyphi A, Salmonella newport and Salmonellaenteritidis); this concept, if used today, would result in 2463 species of Salmonella. The serovars are determined by O and H antigens. The Kauffman–White scheme is used to arrange them (see Table). This taxonomic arrangement classifies the serovars in groups characterized by certain O antigens (semibold). This results in a clinically and epidemiologically useful grouping since certain serovars are responsible for typhoid salmonelloses and others for enteric salmonelloses. The serovars are determined by means of antisera in the slide agglutination test. Phase Variations of the H Antigens H antigens occur with two different antigen structures. The primary structure of flagellin is determined by two genes on the chromosome, only one of which is read off. Whether a gene is read off or not is determined by spontaneous inversion of a DNA sequence before the H2 gene, which inversion occurs with a frequency of approximately 10–4 per cell division. The somatic O antigen is a phospholipid protein-polysaccharide complex, which forms a part of the cell wall. It can be extracted from the bacterial cell by treatment with phenol or alcohol. The O antigen is unaffected by boiling, alcohol or weak acids. It is present both in motile and non‐motile Salmonella. For serological test (Widal test) "O" suspension is prepared either from non‐motile strains or by heat or alcohol treatment of motile strains, which destroy H antigen. When mixed with antiserum "O" antigen suspensions produce compact, chalky granular. The optimum temperature for "O" agglutination is at 50‐55°C. The "O" antigen is less immunogenic than H antigen. This antigen is present on the flagella of the bacterium. It is hat labile protein. It is destroyed by boiling or by treatment with alcohol but not formaldehyde. For serological test (Widal test) H suspension is prepared by addition of formalin to young motile broth culture. When mixed with anti‐serum, H suspension agglutinate rapidly and producing large loose floccules. The H antigen is strongly immunogenic and induces antibody formation rapidly in high titre following infection. The optimum temperature for H agglutination is at 37°C. Vi‐antigen is external to the cell wall. Vi‐antigen is a virulent (Vi for virulence) for mice. Vi‐antigen interferes with agglutination of the freshly isolated organism by "O" antigen. It is a polysaccharide in nature and heat-labile. It destroyed by boiling for one hour. It is not affected by 2% formalin and alcohol. It is lost on serial subcultures. Invasins: Invasins are proteins that mediate adherence to, and penetration of, intestinal epithelial cells. Synthesis of these fimbrial proteins by the bacterial cells is under the control of inv genes. Vi (virulence) antigen: The surface antigen (Vi antigen) has antiphagocytic properties. Rose spots may appear on chest and abdomen in 2nd and 3rd week of infection. Blood, urine, stool, bone marrow, and aspirated duodenal fluid are suitable specimens for diagnosis of typhoid fever. Salmonella is strict parasites of animals or human beings. It causes enteric fever, septicemia, and gastroenteritis. Enteric fever is most usually caused by Salmonella Typhi or Salmonella Paratyphi A, B or C but can be caused by any Salmonella serotypes. Enteric fever is a potentially life-threatening systemic illness characterized by high fever and abdominal complaints. The term enteric fever encompasses both typhoid and paratyphoid fever. Enteric fever is a generalized acute infection characterized by cyclic course, definitive temperature curve, general intoxication, bacteremia and affection of the lymphatic apparatus of the small intestine through which the infection implants itself in the host upon entrance of the causative agent into the gastrointestinal tract. Microscopic examination of Gram staining smear shows Gram-negative bacilli arranged mainly in single. It is aerobic and facultatively anaerobic. The range of temperature for growth is 15‐41°C and the optimum pH for growth is 6.8. Grow on a general purpose or basal medium. Specimens are inoculated into the MacConkey agar; incubate at 37°C for 24 hours. The colonies are large 2‐3 mm in diameter, circular, low convex, smooth, translucent, colorless due to non‐lactose fermentation. It produces uniform turbidity, no pellicle formation. Colonies are large 2‐3 mm in diameter, colorless, circular, low convex, translucent, smooth and non-hemolytic. Salmonellae produce non‐lactose fermenting pale colored colonies, which have the black center on DCA due to H2S production.